I consider myself privileged to have been able to attend Delain's 10th anniversary show in Amsterdam last year. Not only was it a great night with several songs being performed that are rarely played live anymore, but the fact that they invited a few special guests (that had appeared on various Delain albums over the years) made an already unforgettable night all the more special. 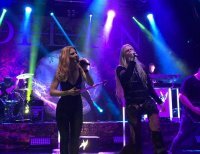 Sadly, one person who had contributed vocals to several Delain songs over the years was unable to make the party, and that person was Marco Hietala (Nightwish). Although the idea to project his image on the back wall during that superb night was exceedingly clever and a great visual spectacle, I still hoped one day I would be able to witness him perform in the flesh with the band. Delain must have been reading my mind because earlier this year they announced a special seven date 'Danse Macabre' tour confirming that the man himself would indeed be joining them for it. Thankfully for me, the last night of the tour was in London. To say I had been eagerly awaiting this show is somewhat of an understatement. That November night eventually came around and I jumped on the train and made my way up to London. Even though I knew the date had sold out, the length of the queue outside the venue just before the doors opened was still a surprise. The night kicked off with Cellar Darling, a band made up of three former members of Eluveitie whose debut album came out earlier this year. Although their set was a short one that consisted of only seven songs, it was highly entertaining. I have to mention this was the first time I had ever seen a Hurdy-Gurdy played live and I also can't remember having ever seen a flute solo in Metal gig before either. Both of these gave Cellar Darling a unique and very enjoyable sound. Their set featured lots of thick riffs and pounding bass with a passionate performance from vocalist Anna Murphy, be it singing, playing the Hurdy-Gurdy or the flute; she even provided a bit of extreme vocals during 'Starcrusher'. Although the increased applause from the audience as the set went on was probably in part due to the venue slowly filling (many will likely have missed the opening few songs), overall the audience seemed to genuinely enjoy their performance. As for my personal highlight, that was 'Avalanche' with its revolving vocal hook during the chorus. After a short break it was the turn of Serenity, a band I have seen live several times, including a few where they have previously supported Delain. I have been a fan of the band since reviewing their 'Death & Legacy' album as one of my very first upon joining Fireworks many years back. Since then, I have always found their highly energetic, hugely bombastic and perfectly played performances (be it live or on album) a pleasure and tonight was no difference. As ever, their outstanding vocalist Georg Neuhauser was once again exuberant and full of passion as he marshalled the crowd, be it from centre stage, knelt down as he cajoled the front rows or stood upon high on the monitors. The music itself was full of soaring solos, thick riffs and thunderous double drumming and bass. Although their set was longer, they also only played seven songs due to their tracks being longer. The set included 'United' and the title track from their latest album 'Lionheart', as well as 'Spirit In The Flesh', 'Iniquity' and set closer 'Follow Me' from their 2016 record 'Codex Atlanticus'. The other two offerings were 'Rust Of Fallen Ages' from their second album and my set favourite 'Serenade Of Flames' from '...Legacy'. Every time they tour with Delain, I always hope that one-time Charlotte Wessels (who performed on the album version) might come out and duet with Neuhauser, however, I can understand the reasoning of not wanting to detract from "the moment of arrival" being the headliners. Both '...Flames' and 'Iniquity' included a female vocalist whose name I sadly didn't catch. Once again, Serenity were an absolute joy to watch live and I look forward to catching more of them on their own headline tour in February next year. After another break, the moment arrived. To say the venue was packed is an understatement, maybe too much if I am honest. I would surmise some people struggled for either a good view or good sound, and even I unusually retreated to the upper tiers for both having had to move from my floor spot after Cellar Darling. Given that Hietala was on tour with the band, and wanting to give him his own grand entrance, it would have shocked no one that the set list had been shaken up somewhat – both content and order wise. That being said, as they had on their last UK tour and at their 10th anniversary show, the instrumental 'The Monarch' opened over the PA as drummer Ruben Israel, guitarists Timo Somers and Merel Bechtold, bassist Otto Schimmelpennick van der Oije strolled out and took over closely followed by keyboardist Martijn Westerholt and finally their sensational vocalist Wessels. They launched into 'Hands Of God' and from the start the sound was clear but still hit you with force matching the ever vibrant and colourful lighting. I can't deny I was somewhat surprised to hear their anthemic closer 'We Are The Others' played second, complete with bubbles blowing from the side of the audience. For obvious reasons, it wasn't going to be the closer tonight, but I couldn't have predicted its appearance so early. Irrespective, it still whipped the audience into a frenzy and remains an all-time favourite song, regardless of where it is played. This was followed by 'The Glory And The Scum', the always great 'Get The Devil Out Of Me', a superb rendition of 'Suckerpunch', the tour title track 'Danse Macabre', 'Scarlet' (which featured just Westerholt and Wessels on stage), a thunderous 'Here Comes The Vultures' and another personal favourite in the fantastic 'Fire With Fire'. Following '...Fire', the moment everyone was waiting for arrived. Wessels finally introduced the man of the moment and out strode the unmistakable figure of Hietala to an immense roar from the audience. Some pleasantries were exchanged between the two vocalists before Hietala turned his attention to the audience as he encouraged them to really give it their all. Everyone was then treated to an excellent four song Delain/Hietala segment that consisted of 'Your Body Is A Battleground', 'Nothing Left', 'Control The Storm' and 'Sing To Me'. I am happy to say his performance was everything I had expected and hoped it would be and it was genuinely exhilarating to finally hear these songs live with both vocalists on stage. Hietala's extremely distinctive voice roared out of the speakers and he was just as charismatic visually; he bent down a few times to place his mic next to the guitars of Somers and Bechtold, prowled around and gave lots of gestures to the crowd as he egged them on. After his departure, Delain played a further two songs in 'The Hurricane' and 'Not Enough' to close the main set before they too retired from the stage. I think anyone reading this can automatically guess there was a considerable noise from the audience for the band to return and, of course, they did. The encore opened with 'Mother Machine' which preceded a rather poignant moment for one of the band members. This was the last tour that Israel would be playing drums for Delain and Wessels took a few moments to allow the crowd to show their appreciation. Given it was the last night of his last tour, it was evidently a very emotional (and quite a touching) moment for all and thus the crowd were given a second opportunity to roar their thanks before they played 'Don't Let Go'. Wessels then re-introduced Hietala who returned for the Queen cover 'Scandal', a track I don't recall ever being played live previously. This simply left only one song that could be played to bring the curtain down on the night. The track that closed so many shows before being supplanted by '...Others'... that of course was 'The Gathering'. I am still a little lost for words to describe how it felt to finally see this song – the one that was responsible for first lighting the Delain fire for me – being played live with Hietala. Suffice to say, it was huge finale with bubbles, a big explosion of streamers and a wild crescendo for both band and audience alike that bought an end to another amazing night watching Delain live. Delain were absolutely fantastic on every level this evening. The band seemed to enjoy themselves as much as ever, as evidenced by the fact there were smiles all round, lots of great interplay and moments between various members, as well as lots of encouragement from Wessels (who was herself mesmerising as always) for the crowd to clap, sing and bounce. Musically, they were on top form, but that is almost a given as I have yet to witness (nor be told about from shows others have been present at other shows) about an off night from them. This gig was yet another example of why I consider Delain to be not only one of the very best live bands in the business, but one of the very best bands around full stop. All I can say is if you have yet to experience the wonderful Delain, then I can only give you my honest opinion that you really are missing out.